The Prices of Shell, Total, Kobil, Hashi, Oryx, Mpishi and Hass cooking gas in Uganda seem to keep rising steadily every year. Yet gas is one of the preferred means of energy especially among the middle class. Choosing a gas brand can be quite daunting if you do not know what to consider. In this post we shall share with you a couple of things. Available brands on the market, prices of purchase and refilling, where to buy them among other things. We shall also share with you a gas comparison chart to help you compare prices of the different brands an what they offer. There are multiple brands and companies that supply Cooking gas in Uganda. Among them are Shell, Total, Kobil, Hashi, Oryx, Mpishi and Hass. Brands like Total and Shell have supplied homes with domestic gas for a very long time becoming household names while some players are relatively new to the Ugandan market like Hass, Mpishi, Oryx, Hashi, PET Gas, MOGAS LPG, Camel Gas, Lake Gas, WES Gas Despite being relatively new, they have grown huge user bases and commercialized the use of gas. When buying a 6kg gas cylinder for the first time, One has to buy the cylinder with the gas in it, a burner plus a grill. If you are buying a bigger cylinder to use with your gas cooker, (Normally these are 12, 12.5, 13, and 15kg gas cylinders) you also have to buy the hose pipe and the regulator. 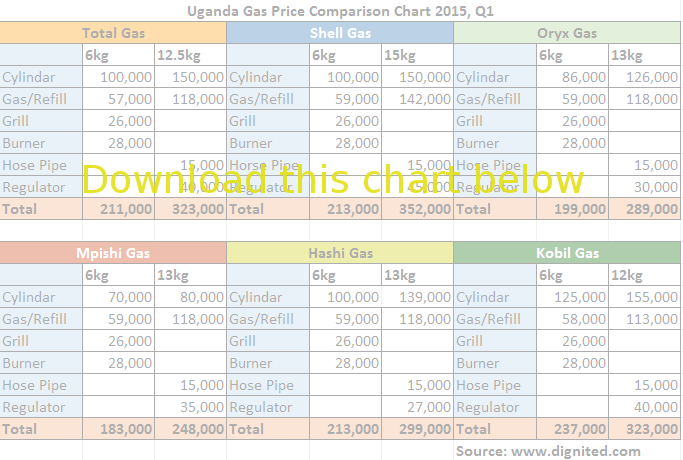 Below is a list of Ugandan cooking gas prices whether you are buying a new kit or refilling your gas cylinder. In this list we are going to compare 6 brands and that is Total, Shell, Oryx, Mpishi, Hashi and K-Gas. Most of the brands used for domestic purposes are sold at the various petrol stations, supermarkets and by vendors. These particular petrol stations sell their own brands as mentioned above. Total, Shell, Oryx, Hashi, Kobil, Oil Libya and Hass. READ MORE: Is cooking with gas really cheaper than electric cooking in Uganda? Top Gas and Lubes Uganda is a company that sells all brands of Gas and accessories in Uganda. This saves consumers a lot of time moving from station to to station or supermarket. They have selling points at Tusky’s Ntinda (0705 555 375), Metroplex Naalya (0705 555 385) and Garden City(0705 555 381). You can call them for all inquiries.